A month into the new school year, and the grand adventure that is Superkids, we already have some great stories. This month, we’re focusing on our Super-Teacher Tatiana Molinas. Tati is extremely passionate about helping people and she dreams of changing the world with a lot of tolerance and perseverance, and above all love and empathy for everyone. Tatiana saw a boy sitting outside in the courtyard during class. She approached the sixth-grader cautiously. “Want to talk?” The boy did not want to talk. “Want to play soccer?” He agreed. Our goal is to prove the nay-sayers wrong. To prove that kids in Paraguay are the same as kids everywhere. To prove that kids will respect us if we respect them. The Superkids Foundation was able to solve the case of the boy who refused to enter the classroom. The teacher stopped yelling. The boy agreed to study again. Through our focus on positive relationships, we hope to continue helping teachers and children to be the best that they can be. Tati saw a girl sitting on the sidelines while the rest of the class was playing soccer during Gym class. She approached her and started a conversation, and eventually gently asked why she wasn’t playing. The girl admitted that it was because she didn’t have gym shoes and that her mother had forbid her to do any rough play because she would ruin her one pair of school shoes. 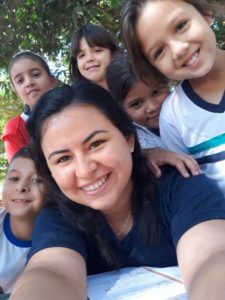 Tati went to the teacher and asked if it would be possible for the kids to all play barefoot (this is really common in Paraguay and most kids play soccer barefoot after school). The teacher agreed, everyone took off their shoes (which they prefer) and the girl joined in the game. She ran up to Tati afterwards, pink-cheeked and out of breath but with a huge grin. She hugged her around the waist and thanked her for making it so that she could play with the other kids. It was such a tiny thing, but because Tati noticed and cared, she was able to resolve the problem and help her. These are just two of the many day-to-day success stories that happen constantly in Superkids. Thank you for your support in helping Superkids and teachers like Tati change lives!